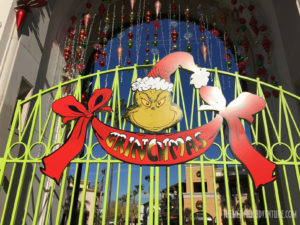 Universal Studios Hollywood is trimming up the tree once again with its annual Grinchmas event, which continues to take place select dates now through January 1, 2017. 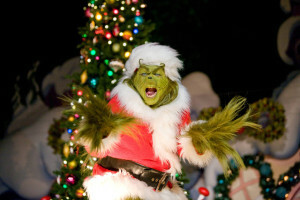 Grinchmas is of course, based on the classic book by Dr. Seuss, How The Grinch Stole Christmas! 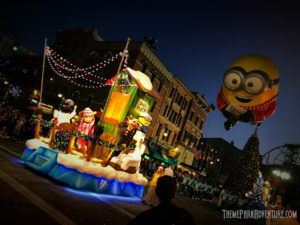 Universal Studios Hollywood has hosted the annual event for years now, and while aspects of it may be losing some of its luster, guests visiting the Los Angeles theme park certainly seem to enjoy the celebration. 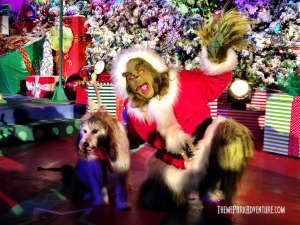 The star attraction of Grinchmas is The Grinch, followed by all of the Whos that populate Whoville, which has a temporary home in Universal Plaza on the parks Upper Lot, as well as the more permanent set location on the Backlot, which is seen by guests riding the Studio Tour. Visitors on the Studio Tour stop at the set from the 2000 Ron Howard re-telling of the popular Christmas tale, and are treated to a short song and dance medley which features the beloved classic, “You’re a Mean One, Mr. Grinch”. Grinchmas runs weekends on December 5-6 and 12-13, then continues daily from December 18, 2015 through January 3, 2016. Christmas 2014 has arrived, and with it, Theme Park Adventure’s final construction update of the year from Universal Studios Hollywood! Just like a big ol’ present, we’re going to unwrap it here for you with some words, lots of pictures, and let you have fun looking at it, and sharing it with your friends and loved ones! Naturally, the biggest focus of the story is The Wizarding World of Harry Potter. 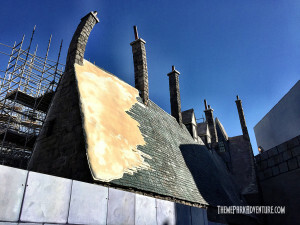 Construction on “Potter West” has hit full stride, and we definitely have an abundance of images to share with you, and some really cool “firsts” that should make every theme park fan in Southern California extra giddy this holiday! Grinchmas runs weekends on December 6-7 and 13-14, then continues daily from December 19, 2014 through January 3, 2015.